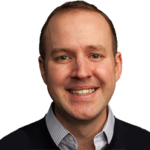 Watch Tidings Founder David Mihm go "from nothing to newsletter" in 7 minutes in the video below, or read on for more details. Get started by entering your Facebook Business Page address (URL) or Instagram handle in our widget. With this tiny bit of information, we’re able to learn a lot about your business, including the name of your business, your branding, what industry you’re in, and of course any content you’ve shared. All of these attributes help us customize your newsletter, and help you get the most out of our service. With your Facebook Page or Instagram information, we’re able to generate a preview of what your first newsletter might look like. Your preview is 100% editable, and is designed to give you as full an experience of the product as we can. 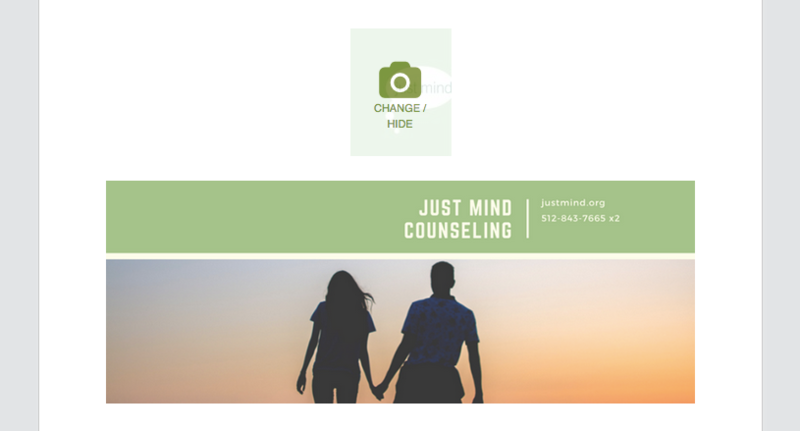 We automatically pull your logo/profile photo (and cover photo from your Facebook Page), and resize them for optimal performance in emails. Feel free to upload a replacement for either or both (or remove either or both) simply by clicking Change/Hide on either image. 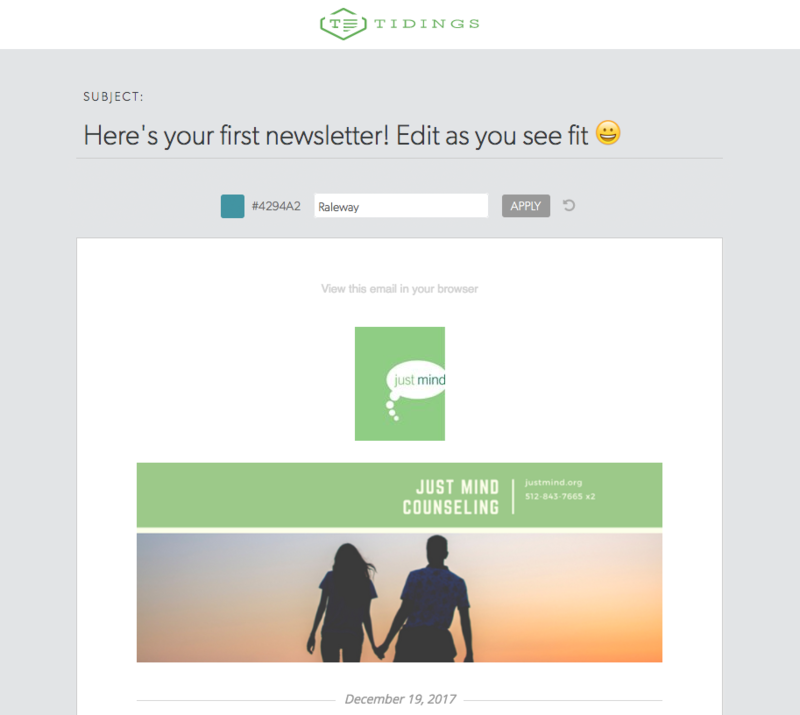 We’ve tried to match your newsletter template to your website as closely as possible, but you can easily adjust the color scheme and font of your newsletter. Just choose your desired color and font from the palette or dropdown menus and Apply your changes. Keep in mind that due to limitations of certain email clients–including Gmail and GSuite–not all subscribers will be able to view your email using your custom font. We’ll show a close-replacement font in these cases. As with all text areas of your newsletter, your subject line, introduction, and call-to-action are completely editable. Give your readers an idea of what caught your attention most in this newsletter, and/or direct them to an action (such as saving 20% on their next service, or giving you a referral). On your desktop or laptop computer, simply click your cursor into one of these fields and start typing. On mobile devices, tap the desired field to pull up your device’s keyboard. We’ll automatically include the last 5 articles you’ve shared on Facebook or Instagram (within the last 45 days) in your newsletter. As with your subject, introduction, and call-to-action, the title and snippet for each article is fully editable. So if you want to adjust the content of any article, simply move your cursor into these areas and start typing to edit. 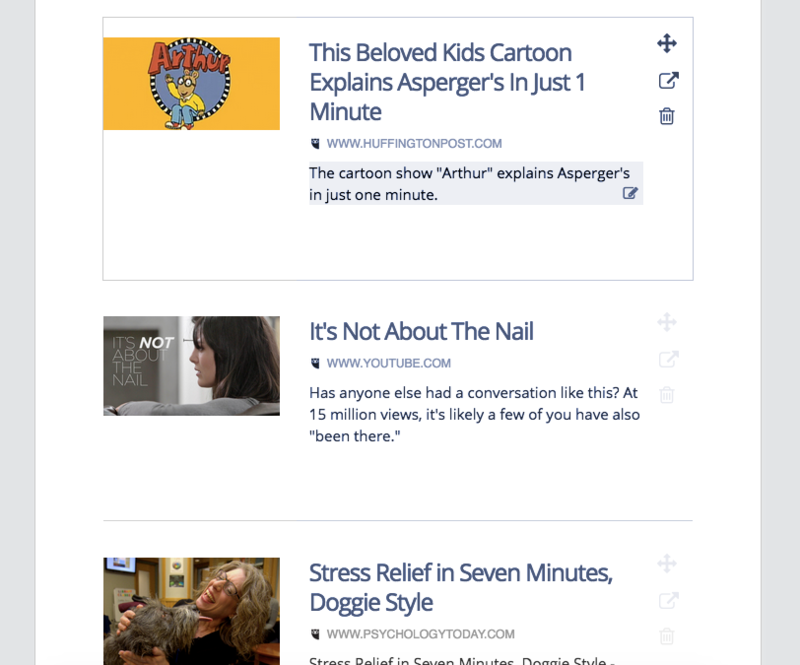 You can also change the order of articles by dragging the icon, and remove articles you don’t want to share in your newsletter by tapping the icon. 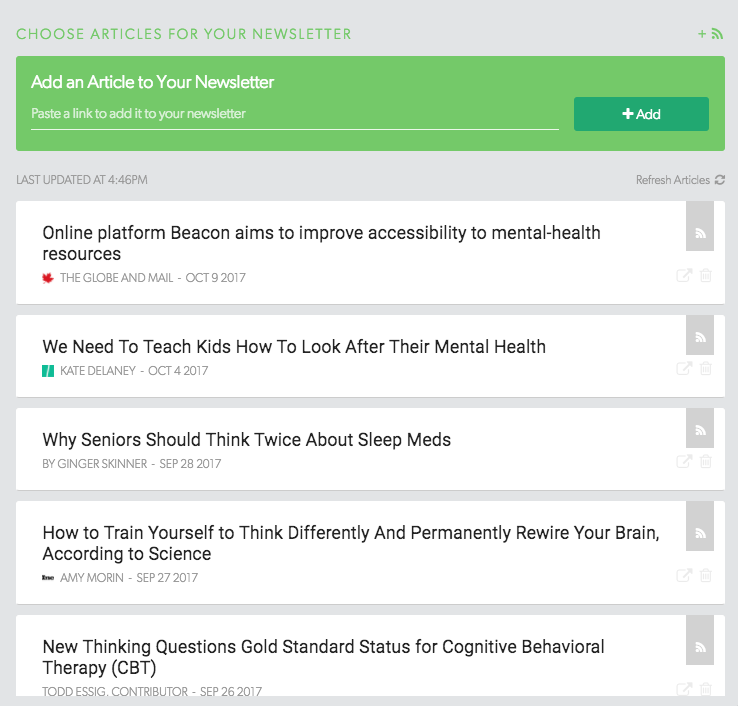 It’s easy to add new articles to your newsletter, too. Just copy the link address from your browser, paste it in the box, and tap Add. You’ll see the article added to your newsletter in real-time! You can change the position of the new article by dragging it just like any other article. And if you don’t like the article’s title or snippet, feel free to edit them. Once you’ve signed up for an account, you’ll see additional articles appear in the righthand sidebar of your newsletter builder (desktop) or in the drawer after clicking “Add Articles to Newsletter” (mobile). These articles come from your Facebook Page, our suggested content stream, and any RSS feeds you might have added during configuration. You’ll see the source denoted by the or icon. To add them to your newsletter, simply drag them from your stream into the desired spot in your newsletter (desktop) or click the icon (mobile). To do so, simply look for the gray “Send Preview” button in the Delivery Details section of the newsletter builder. Our product integrates with your existing email service provider to send your newsletter — no code updates or new sign-up forms required. It’s a set-it-and-forget-it integration. 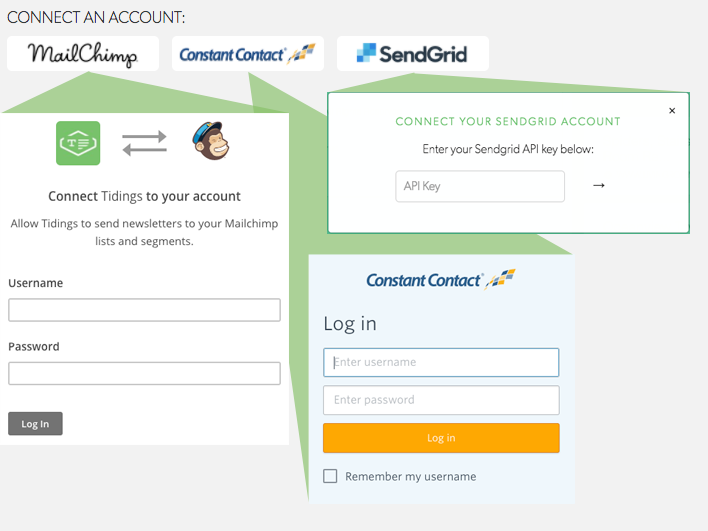 Simply click the icon of your email service provider, enter your account credentials, and all of your lists and segments will now be available to send to. W00t — the grand finale! 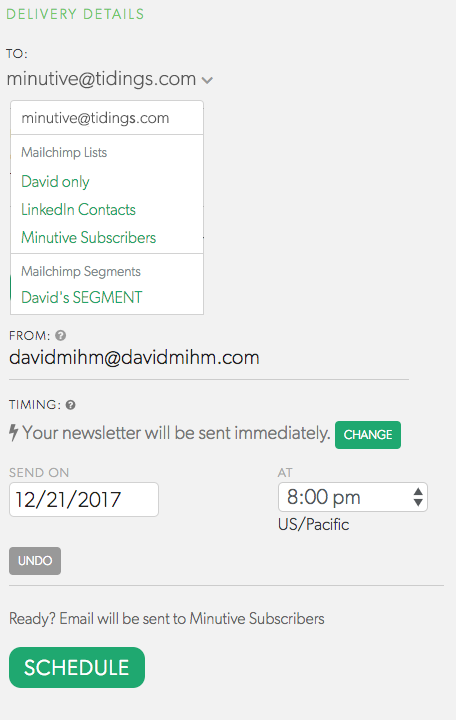 Choose your newsletter recipients by selecting your desired list or segment from the dropdown menu. If you want to send your newsletter immediately, just click Send. But, if you’d like to schedule it in advance click Change to pull up the scheduling interface. Choose your desired time and date, and click Schedule. That’s it! Sit back and relax while we do the rest. It’s easy to save articles to your next newsletter as you come across them in your day-to-day browsing activities. To get started, head on over to your Settings page and create an Account Key. Your Key lets us know to which newsletter to save the articles, without having to log in every time. Next, install our browser extension for Chrome or Firefox, or download our iOS app and paste in your Key. That’s it! 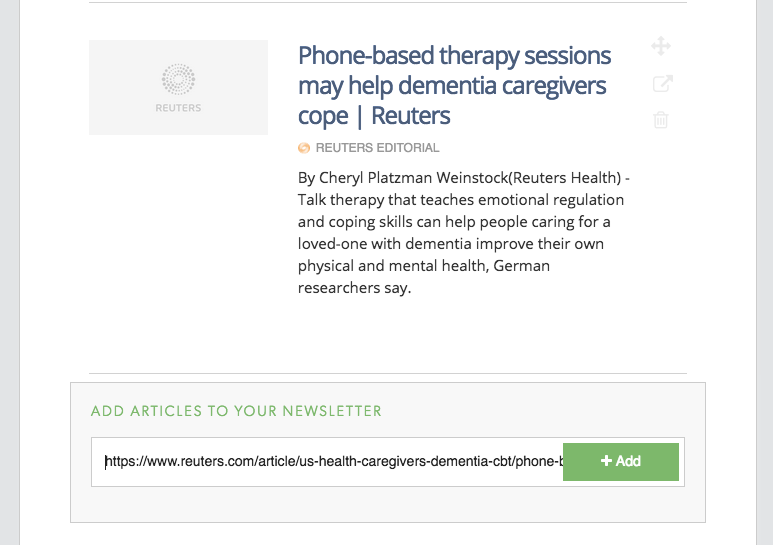 You can now save articles from around the web with a single click. That does it for the guided tour—thanks so much for checking it out! If you have specific questions about the product or ideas for new features, we're all ears! Just let us know using the form below. Get Notified When We Launch? Yes, please send me an email. See for yourself how fast, easy, and fun it can be to send a newsletter.